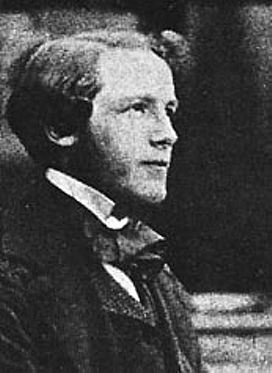 James Clerk Maxwell was one of the world’s most influential physicists, an eminent Cambridge scientist whose work was grounded in his Christian faith. He is famous for his scientific explanation which combines electricity, magnetism and light into a single mathematical theory. His work led directly to the development of radio and then television. 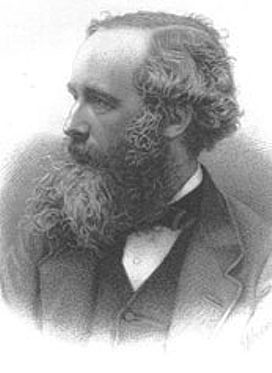 James Clerk Maxwell was a nineteenth-century scientist, one whose memory and theories are still revered today. He was also a prominent Christian layman of his time. He was born in Edinburgh in 1831. His father, a lawyer, had taken the extra surname of Maxwell in order to inherit property. His birthplace now maintains a small museum set up in his honour to increase the public awareness of science. James’s mother took responsibility for his early education. As a young boy he acquired a wide knowledge of scripture. At eight he could recite long passages of Milton and all 176 verses of Psalm 119, the longest in the Bible. Young James enjoyed a privileged childhood, although his mother died from stomach cancer in December 1839 when he was only eight. His education was then overseen by his father and his father’s sister-in-law, both of whom played pivotal roles in his life. Maxwell studied mathematics at Edinburgh University and won a place at Peterhouse, Cambridge, before transferring to Trinity College. In 1854 he was placed second in the maths Tripos, and was elected a Fellow of Trinity. He was a member of the ‘Cambridge Apostles’, an elite philosophical and theological society. He also came under the influence of the radical professor, F D Maurice, and taught in the newly-founded Working Men’s classes each week. After a spell as Professor at Aberdeen, Maxwell moved to King’s College, London. Here he undertook his greatest scientific work. His fame rests largely on his mathematical explanation which combines electricity, magnetism and light into a single theory. His equations underpin our everyday use of electricity and telecommunications and led directly to the development of radio, television and electronics. He also made important discoveries in the field of colour vision which make possible colour photography and colour television. 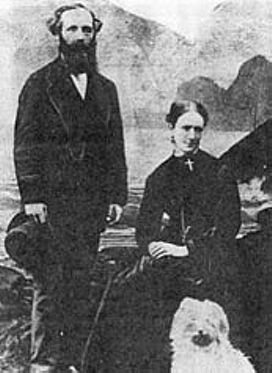 Maxwell, with his wife Katherine and their dog. Maxwell was known to talk to his dog about his scientific theories. In 1871 he moved back to Cambridge as the first Cavendish Professor of Experimental Physics, responsible for creating the new Cavendish Laboratory, setting in place modern schemes for the undergraduate study of science, and leading to the later discoveries for which the Laboratory is famous, including the discovery of the electron, and the splitting of the atom. Maxwell had a thorough knowledge across a range of subjects. As well as his scientific discoveries, he loved poetry and enjoyed drawing. Despite his many accomplishments, he lacked self-confidence in social situations. Maxwell was also an evangelical Christian. He was an Elder of the Church of Scotland, and in England he worshipped in the Church of England, though he was quite willing to worship elsewhere to listen to the Word of God preached well. He exchanged long letters with his wife and others in daily bible study, prayer, and religious thought. His scientific worldview grew out of his Christian faith, which he subjected to the same rigorous analysis as he did the physical world. To Maxwell, everything in this world was created by God, including scientific knowledge: he did not compartmentalise his scientific and theological inquiries, although he held that each had its own proper area. In Cambridge he regularly engaged in discussions of theology and philosophy with leading figures such as Brooke Foss Westcott, Fenton Hort, and Joseph Lightfoot. He was consulted by bishops as a scientific expert. After just a few years back at Cambridge, on 5 November 1879, he died of stomach cancer, the same disease which had killed his mother. He was not quite 48. Widely recognised in his own time as an important scientist, his reputation has grown immensely since his death, so that he is generally regarded as one of the greatest scientists of the nineteenth century, if not of all time. His work provides the foundation for so much of modern science, the technology we rely on, and our understanding of the physical universe which he believed was created by a loving God.